No matter what the season, I like to walk through the garden looking for something to cut and arrange indoors. At first glance in late fall, it may seem like there is little available to arrange. 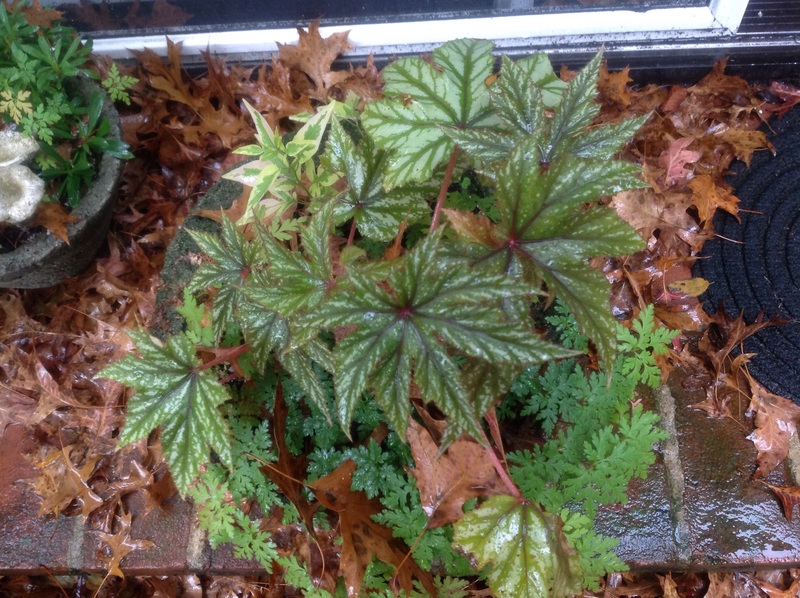 With a little imagination and an open mind, I spot some interesting foliage of potted silver Rex begonias that I really should be bringing indoors before the first frost. It would be interesting in an arrangement. I am planning on using a birch bark vase and the silver patterning in the leaves will complement the silver of the bark while the burgundy veining and undercolor will bring a fall element to the arrangement. Sedum ‘Autumn Joy’ still growing in wild abandon with its purple orbs would look great with the begonia foliage, so I cut a big bunch. Thinking of how tight and compact these flowers will look in a bouquet, I search for a trailing vine to soften the look. 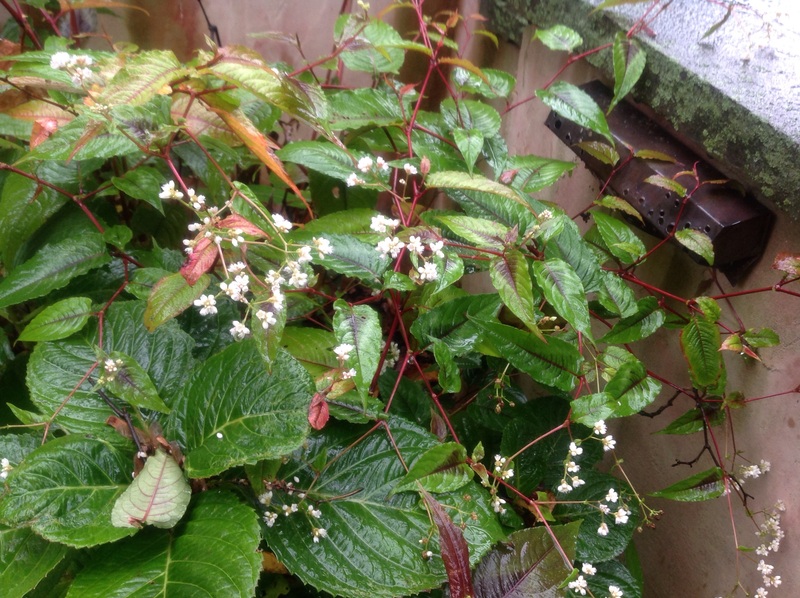 I decide to cut some varigated purple persicaria ‘Red Dragon’ which just happens to be blooming with a delicate spray of white flowers, another great complement to the birch. I arranged the trio in a beautiful birch bark-covered galvenized tin vase from Save-on -Crafts online. ( http://www.save-on-crafts.com/birchvases1.html) A glass vase hides inside the bark vase and a collar of moss held on by duct tape gives a finished look to the top of the vase. Voilà: a naturally beautiful arrangement, a late gift from the fall garden. 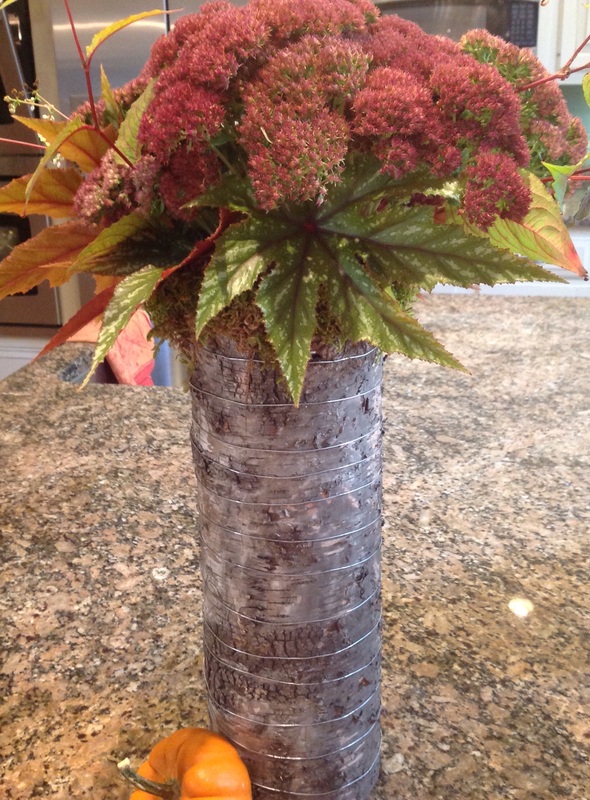 This entry was posted in Entertaining, Gardening, Tablescapes and tagged bark covered vase arrangment with fall garden flowers, Fall flower arrangemnt with sedums, persecaria and begonia fall arrangement, Sedum by Johanne Lamarche. Bookmark the permalink. 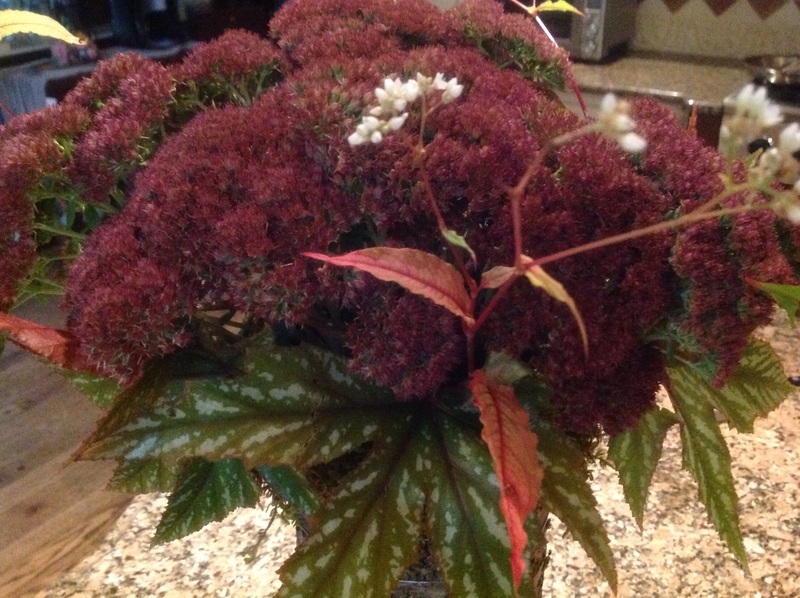 Your sedum arrangement is beautiful, Johanne! I’m hoping my newly planted sedum will provide like this in the years to come. 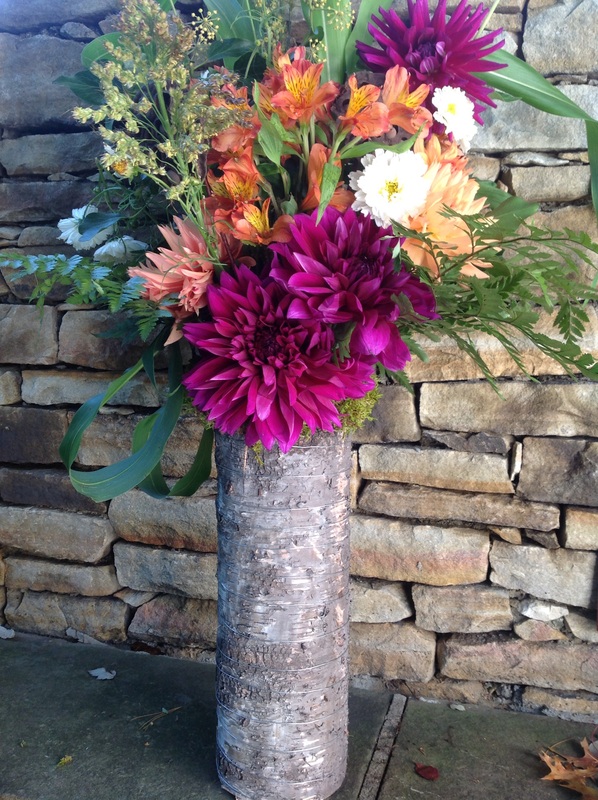 You added just the right filler flowers and leaves to give the arrangement a fabulous custom look for fall! I have several of those same bark-covered vases!!! I think I bought them last year at one of our local wholesale places. I’m using them for one of the fantasy tables I’m doing for an upcoming fundraiser with a woodland theme. They really do come in handy for fall and winter decorating!!! Those containers are just fabulous! I know they will become sensational in your creative hands Alycia! I threw this together for a meeting i hosted this week and everyone raved about it so…..there could be a post in there I thought! Enjoy your weekend! What a wonderful idea. 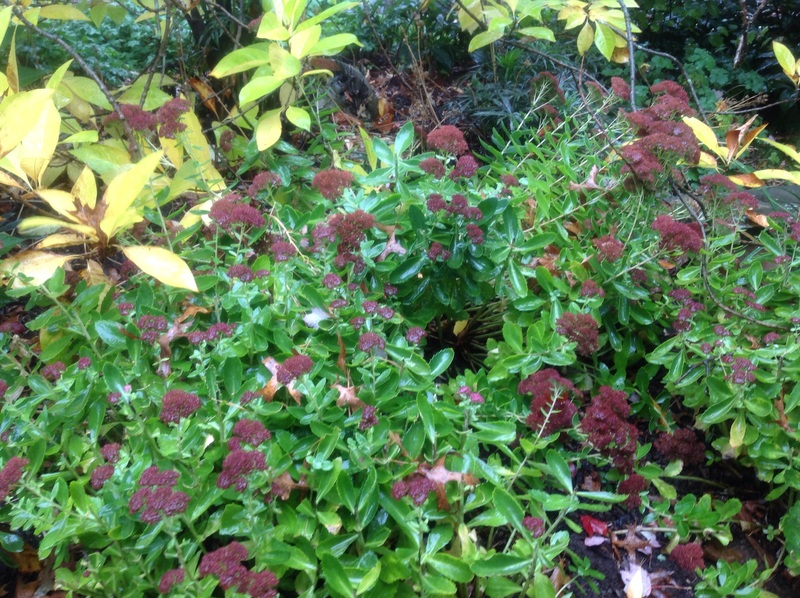 I have lots of sedum of different varieties, and now I see what a beautiful bouquet I can make with them – and will. Thanks for the inspiration. Love the vase too. I think sedum get overlooked and underappreciated when it comes to floral arrangement. Happy to have sent some inspiration to Canada, Hilda. What a sad week. I have shed so many tears. I feel like our innocence was lost. So many uplifting stories in the crisis that were heartwarming too. Enjoy your weekend. I just made a beautiful bouquet with my sedum and wanted to thank you for the idea. I mixed it with some very frilly rose scented geranium leaves which to very well with it. Btw, leaves of both the plants are edible and delicious too, and aroma is delightful, at least for the first day. I always learn so much from you Hilda! Never in my wildest dream would I have thought sedum leaves would be edible but Ilooked it up and you are right! Glad you are enjoying your bouquet of sedums. I think we overlook their beauty indoors and consider them more as ground fillers but they are quite beautiful cut. Enjoy! but it’s actually an amputation right ?